The Acorelle Organic First Tooth Balm naturally relieves the pain associated with the appearance of the first baby teeth (double gums, dental breakthroughs). It is composed mainly of thermal water of Castéra-Verduzan, known for its soothing virtues thanks to the mineral salts and trace elements it contains. Extracts of chamomile and organic marshmallow reinforce the soothing action of thermal water and combat irritations of the mouth. Composed of stevia, natural sweetener, it is appreciated by the little ones thanks to its naturally sweet taste. Its transparent and gelled texture is easy and pleasant to apply. 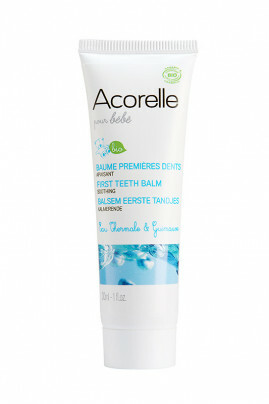 Restore the smile to your baby thanks to Acorelle Organic First Tooth Balm! On a clean finger, drop a small amount of this organic dental gel and apply directly on the gums of your baby in light massages. To use from the first pains and you can apply as often as necessary. An organic baby dental gel with natural ingredients! AQUA (THERMAL SPRING WATER), GLYCERIN, AQUA (WATER), HYDROGENATED STARCH HYDROLYSATE, CELLULOSE GUM, GLUCONOLACTONE, ALTHAEA OFFICINALIS LEAF EXTRACT *, ANTHEMIS NOBILIS FLOWER EXTRACT *, STEVIA REBAUDIANA EXTRACT, POTASSIUM SORBATE, SODIUM BENZOATE, SODIUM HYDROXIDE, CALCIUM GLUCONATE , CITRIC ACID.